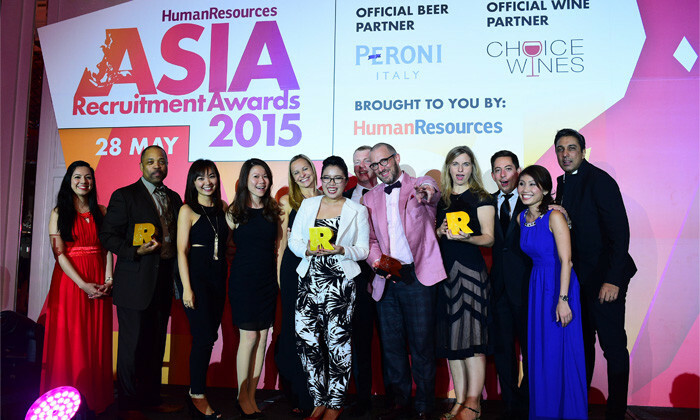 GroupM Asia Pacific and Elliott Scott HR Recruitment bagged gold as the Grand Winners of the first-ever Asia Recruitment Awards 2015, held in Singapore last night. After a succession of trophies in various categories, the two companies took home the top honours as the best in-house recruitment team and recruitment agency, respectively, at the inaugural ceremony. In a celebration of recruitment successes in the past one year, the Asia Recruitment Awards honoured the efforts of companies that aimed to disrupt the industry. In front of a record-breaking audience of 345 top talent acquisition specialists at the Hotel Intercontinental, GroupM Asia Pacific established themselves, securing the gold awards for Best Recruitment Technology, Best Career Website, Best Recruitment Advertising Strategy. They also won two silvers for Best Recruitment Evaluation Technique and Best Staff Referral Programme. Not to be outdone by their in-house counterparts, Elliott Scott HR Recruitment emerged victorious among the recruitment agencies, bagging silver for Best New Recruitment Agency, gold for Best Client Service, bronze for Best Regional Recruitment Programme, alongside their coveted Grand Winner trophy. Infocomm Development Authority of Singapore (IDA) followed suit with 5 trophies, winning gold for Best Employer Brand Development and Employee Brand Development. They topped their tally off with bronzes for Best Staff Referral Programme, Best Staff Recruitment Evaluation Technique and Best Use of Digital Media. The Recruitment Agency of the Year category proved competitive, with Scientec Consulting grabbing top honours with gold, just edging out Michael Page and Robert Walters. In the category for Best New Recruitment Agency, new kids on the block, 33 Talent wrestled the gold in what proved to an extremely tight and neck-to-neck race to the finishing line. Amongst the Best Graduate Recruitment Programmes, Maybank came first, in testament to the bank’s extensive efforts in the war for the new generation’s brightest talent. The regional bank also took home the silver trophy for Best Recruitment Evaluation Technique (In House) and bronze for Best Candidate Experience (In House) respectively. In light of their initiatives to bolster their forces with the latest in digital recruitment, Certis CISCO Security won in style, earning the gold for Best use of Digital Media, along with a silver in Best Recruitment Advertising Strategy. Competition was fierce as ever for the Best In House Recruitment Team of the year with contenders ANZ Bank, VMWare, IDA, Dell, Novartis Consumer Health and Changi Airport Group battling it out – with VMWare making the cut to pole position. In the individual categories, the contender from Real Staffing Group, Manjit Kaur won gold as Recruitment Consultant of the Year, with Walter Tan from Charterhouse Partnership following close with a silver in hand. Amongst in-house recruiting professionals, Eileen Oh from Changi Airport Group scored the gold trophy for Recruitment Professional of the Year, followed closely by Shmeer Bharoocha from ANZ Bank with the silver. Other notable mentions for the night include Kadence International, which won gold for Best Candidate Experience (In House). Best Recruitment Innovation saw gold winners for both JobStreet.com for Best Recruitment Innovation for the agencies and Citi Singapore for in-house teams. All entries were judged by HR industry experts across the region, who spent weeks pouring over each and every entry in the lead-up to last night. Considering a change career? Make sure to look at which industry has the highest potential for salary growth in the next seven yea..